26 years after its first performance off-Broadway, Joel Paley’s spoofy musical comedy transfers to London’s Arts Theatre. Telling the story of tiny stage sensation Tina Denmark, an 8 year old girl who’ll do anything to achieve her Broadway dreams, Ruthless! The Musical twists and turns through murders and mysteries, as Tina, her ditzy housewife mother Judy, and her flashy talent agent Sylvia St Croix, pursue the rocky path to fame. First and foremost is has got to be said that Tina, a precocious adolescent murderess, is an absolute scream and actor Anya Evans (who shares the role with 3 other actors) makes the most of every moment she is on stage. With bags of talent and a death glare to be reckoned with, she sells the musical's premise from the moment she utters her first treacly line right up until her final blood soaked bow. With a purposefully absurd number of twists and turns, the plot keeps everyone guessing as they giggle along. Ruthless! The Musical is most definitely a musical written for eager musical theatre fans. Despite a strong derogating of the genre by Tina's drunken grandmother, theatre critic Lita Encore, the book features a few stagey gags and parodic moments, referencing musicals such as Gypsy and Sunset Boulevard. However, all of Ruthless! The Musical's melodramatic reveals could do with more energetic build-ups to really elevate the jokes to belly laugh territory, and the smattering of musical theatre references dropped in don’t occur regularly enough for the ongoing joke to gather much momentum. That being said, Jason Gardiner’s Sylvia St Croix making a spotlight stealing entrance in a long coat and turban, declaring 'I’m still here' is a fun little moment. It has to be said though, that for all its attempts to be outrageous and irreverent, Ruthless! The Musical seems to lack the bite that other similarly cheeky musicals possess. 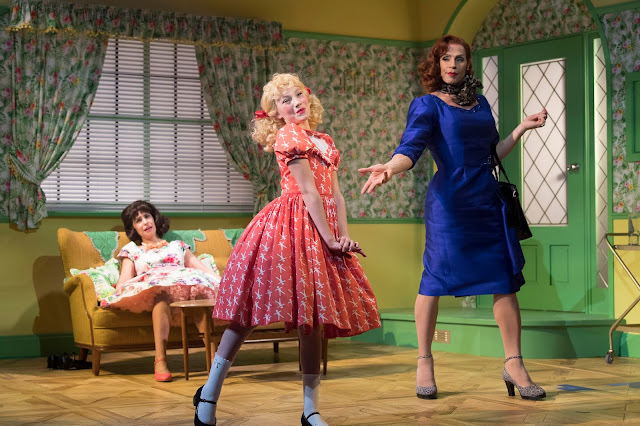 Gaudy 50s inspired sets feature heavily in act 1 and epitomise the sweet and uncomplicated lives of Tina and her mother at the beginning of the story. However, in act 2 once Tina’s despicable deed has been completed and her mother has abandoned her to chase her own showbiz dreams, a sleek and glamorous New York apartment becomes the musical's main location. However, the piece maintains its earlier cartoonish vibe in other ways, for example Lara Denning is hilarious as coked up and maniacal Eve, a wannabe stage star desperate to crawl her way up the food chain. In fact, act 2 is where Ruthless! The Musical’s jokes flourish. It’s just a shame that Tina is incarcerated off stage in the Daisy Clover School for Psychopathic Ingénues for quite a lot of the time, as when she does appear, dressed up in a black and white striped hoop skirt of course, she’s an inimitable bright spot. All in all though, what’s prevalent throughout the musical is its relative tameness. Ruthless! The Musical feels like it wants to be outrageous but doesn’t ever really go far enough to truly shock. It may have seen surprising to hear a young child swear on stage back in 1993, but it’s much less impactful today, in a world of Spelling Bees and Spring Awakenings. Sure, it’s a fun romp, but Ruthless! The Musical misses more marks than it hits where the gags are concerned. That being said, there's still plenty to enjoy, especially for those who are fans of broad humour, and even broader characters. There's some face shredding belting, a plot going at 200 miles per hour, and countless surprise turns which will keep audience members on their toes. It may attract a slightly niche audience, but there's definitely an appetite for this kind of digestible musical comedy fare.